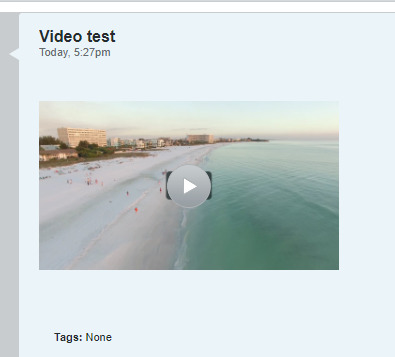 On vBulletin 5.5.0 by using the BBcode by default, videos are inserted with two black bars, videoz are too small by default. Last edited by lange; Thu 7th Feb '19, 7:17pm. There are no black bars on your linked video when I view it which means it's most likely your TV resolution that is causing the issue. The original videos on Vimeo & Youtube are already in 16: 9. They should be in 16:9 by default on vBulletin 5.5.0 too. How to increase the size to 800 x 450 px in 16: 9? Last edited by lange; Thu 7th Feb '19, 7:18pm. The original videos on Vimeo & Youtube are already in 16: 9. They should be in 16:9 by default on vBulletin 5.0.5 too. On most videos if you right-click on the video and copy the embed code you can edit the dimensions manually. This is the YouTube embed code from your video. The problem is you need to maintain the aspect ratio to avoid distortion and that 1903 / 797 is not a normal aspect ratio. It would scale down to 800 X 335. The question is how do these two things (black bars and size) with settings inside vB 5.5.0? If I understand you, there is no setting and we must encode the videos ourselves in vB 5.5.0. Is that right? The quickest solution is to get rid of the black background color and border. Thanks, Glenn. I guess I only half understood the question. So, I only half answered it. @ Glenn, thank you very much, I saw your code somewhere yesterday. Also, I have to say you are a talented developer, your forum proves it ! Anyway, my anger, my frustration has fallen now. Im just starting with 5.5.0, I'm familiar with 3.8.11 only. I have just made my first video test one hour ago and ...I saw this little image, it's a very unpleasant surprise !! In Omnibus, thank you very much for your hint!! Last edited by lange; Thu 7th Feb '19, 7:19pm. Is Youtube Video size fixed in vBulletin 5.2.6? Video from youtube big default?